We weren’t too sure how we felt about the Balcones Texas Single Malt Whiskey when we first tried it. It was one of those spirits that you can’t quickly and easily wrap your head or palate around. In many ways that’s the point. Balcones distiller Chip Tate is somewhat of an iconoclast – he consistently and intelligently pokes common spirit convention in the eye with a sharp stick. After all, what exactly is Texas Whiskey? The answer to this question is as much a thesis in a bottle as it is an exceptional and infuriating spirit. We are big fans of his corn whiskey, both the Baby Blue and True Blue whiskey, but Balcones Single Malt Whiskey is nothing like those. Made from malted grain, this high-proof whiskey is aged in ex-bourbon casks. It’s a whiskey that simply doesn’t fit neatly into any real style of whiskey. On one hand there’s excellent preservation of the grain notes like you’d find with Scotch style whisky, and on the other hand you have the barrel-forward spice of an American style. Of all the whiskeys we’ve tried lately, the Balcones Texas Single Malt required the most time and effort to work through and ultimately come to some sort of conclusion about how we felt about it. 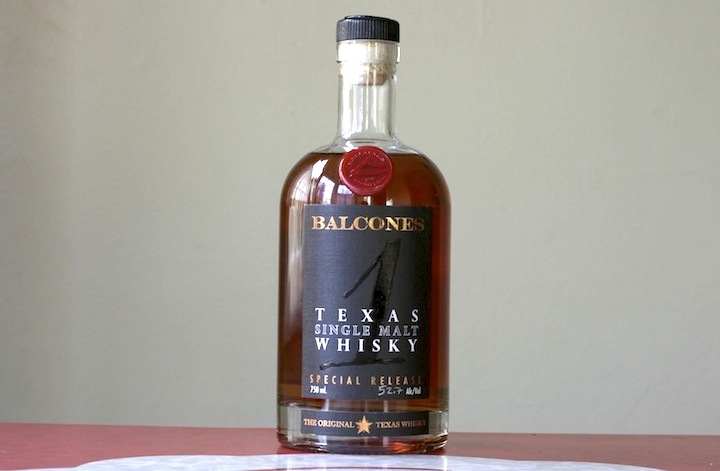 Balcones Single Malt Texas Whiskey (52.7% / 105.4 proof, $65) leads with a clear malted grain note on the nose. At first nosing this whiskey could be confused with something Scottish. But quickly behind the malt, other notes emerge including comice pear, honey, and sawdust. It’s when the sawdust note emerges that it’s clear that this whiskey is something completely different. The nose keeps on developing with dried apricot, cinnamon, and oak. There’s a lot there and the aromas in the nose are structured in a way that not only invites you to dig around, it forces you. The entry of Balcones Single Malt Texas Whiskey is sweet; for a moment we did a double take, wondering if indeed this whiskey came from blue corn, as that sweet corn and light earth tone lead off the charge. After a moment we realize that indeed it is not corn we are tasting, but grain – sweet honeyed grain which remind us of the first bowl of cereal right after you open a box of cheerios. Just as we begin to get a handle on the grain notes, the whiskey makes another turn and sweet caramel bursts from its core, followed by a shotgun of cinnamon and oak spice. There’s no delimitation here between entry, midpalate, and finish – this whiskey is a thrill ride for your mouth with twists and turns that rival some of the rides at Six Flags. After the burst of spice, the grain notes return as does the caramel and together, along with a balanced level of spice, the flavors come together for a nice finish that adds a hint of cool on the palate as it exits. It’s only at the end of the finish that we are reminded that Balcones Single Malt Texas Whiskey is high proof. The precision here of flavor delivery and alcohol is simply perfect. Amazing, fantastic, revolutionary – yes, this whiskey is all that. But it’s also slightly maddening as it takes the conventional whiskey experience and turns it on its head. This is truly a whiskey connoisseur’s whiskey and a spirit for those of us who enjoy a wild journey that only a select few spirits can really take you on. There are few voices in the craft spirit movement as unique and exciting as Chip Tate, and he’s produced a whiskey here that’s as much a declaration of independence as it is a thesis on whiskey. It’s a very high bar that Chip has set and we wait with bated breath to see what he comes up with next.